There are a number of independent manufacturers that are going up against the big names like K2, Rossignol, Volkl, and the like. The independents do their own research, development, marketing, photo shoots, and team building. Their products sell by word of mouth, Internet and a few retailers. People like to buy something when they can talk to the owner or builder of the product. It's also cool to have something nobody else on the hill has, especially if the company is from the Reno/Tahoe area. Smokin Snowboards of Reno, Nevada was founded by Jay Quintin, a former pro snowboarder. Smokin has an entire line of boards,including their "Clash Rocker" high performance hybrid camber technology on their freestyle boards. Smokin Snowboards are made in the U.S. Moment Skis of Sparks, Nevada has a line of skis for both men and women. Moment was the brainchild of Casey Hakansson, an area High School grad. Moment skis are manufactured in Sparks, and sold throughout the U.S. and Canada with ski retailers and the Moment website. Praxis Skis are "Handcrafted in the Sierra Nevada Mountains", on the North Shore of Lake Tahoe. Praxis skis started out in a small shop in Truckee, by builder Keith 0'Meara. 0'Meara wanted a better powder ski so he decided to design and built his own. Praxis is a is a low volume manufacturer (500 per year), but profitable. Praxis uses progressive shapes and bends to produce a great powder ski. 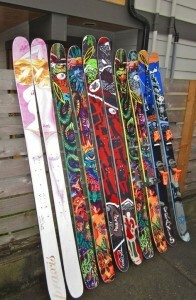 It's nice to see independents giving buyers additional choices when they go to buy skis/boards. The competition for better designs can only help to push the industry to a higher level. Who isn't looking for a better ski or board?